Watch this travertine repair & restoration video to learn about our services. Tell us about your travertine issues. Stone Makeover technicians can restore your travertine to look like new again. Other travertine services include sealing, enhancing, or changing your current finish to the finish of your choice. Regardless of finish type, your travertine needs to be cared for and will, from time to time, need maintenance. Stone Makeover technicians are trained and experienced in cleaning, honing, polishing and sealing travertine. 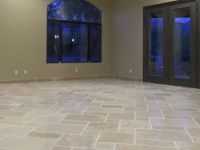 We can make your travertine look like new and keep it looking that way with periodic restoration services. Please take a moment to watch our video about our travertine services and what you can expect from the professionals at Stone Makeover. For travertine floors, shower walls, and more, we provide travertine repair and refinishing services throughout the New York and New Jerseyareas. Contact us online or call (800) 661-7866 today!